Every market has market trends, from the runway to the grocery isle, keeping up with what’s new in the industry can help attract new customers. So what’s new in the food world recently? Well, health of course, and like most industries the environment (going green, buying local, …etc. ); but what about flavors? Recent market research from food trend research publisher Packaged Facts shows that spicy flavors are at the top of the consumer wish list. And the industry is following suit. 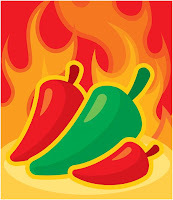 As with any new trend, the spice craze has opened doors for innovation all over the industry: all of the burger joints are releasing their new jalapeno/spicy burgers, hot sauce is becoming more and more popular, and Mexican and Tex Mex are all the rage lately. It all makes sense, adding spice adds flavor; whether it’s from jalapeno or chipotle peppers, spicing a dish up adds flavor without having to add fat or salt (which let’s face it we are terrified of as consumers). Here’s a visual for you. 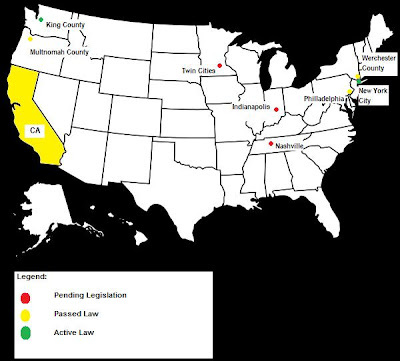 Check out the map above where I have pointed out some of the passed, pending, and active menu labeling ordinances that I have noticed in the recent news. I should also point out that each of these laws differs or will differ in their parameters. For example; California’s menu labeling ordinance will only apply to restaurants with 20 or more locations in California; while New York all restaurant chains with 15 or more units in the US are affected. These laws also differ in which nutrients restaurants are required to post, and where in the restaurant the information must be listed. If you have read about other pending menu labeling laws please post a comment.